"I cleaned the house, fed the dogs, cooked for myself." The new mom from the famous 2001 McDonalds television ad revealed on Instagram that she was home alone for much of her last trimester and did everything herself (she had no household help). She said she enjoyed her pregnancy very much despite feeling "emotional" that she attributed to pregnancy hormones. "I cleaned the house, fed the dogs, cooked for myself (learned to cook delicious healthy food, in fairness. Queber kung pan seared garlic lamb chops 'yan with pumpkin soup and veggies on the side every other day), slept eight hours, went to whereever I wanted (salon, malls, friends house, restaurants). Yup! Na-enjoy ko siya [pregnancy]," she wrote on Instagram. There was one mishap that could have been a cause for concern, but Karen probably recalls it now with a lot of humor. "I'd like to thank those people who were there for me when I was pregnant. My family, friends who kept me sane and the neighbor who helped me when I got stuck/locked out sa terrace at seven months. Salamat!" she added. 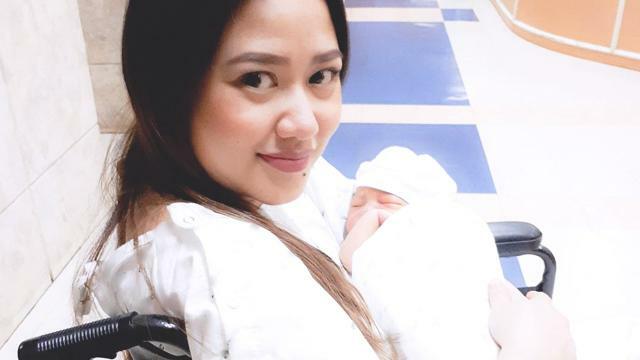 The new solo mom (she has never spoken about who the father of her son, Gabriel Lucas) is enjoying motherhood. She has survived the first few weeks of little-to-no-sleep-at-all stage, including breastfeeding, with the help of family and friends and some Rockabye lullaby songs. Rock on, Karen!